One industry that’s been impacted and reshaped by digital disruption is the fashion industry. Especially retail stores have faced big changes as a result of the adoption of digital devices that enable consumers to make price comparisons and do product research in real-time. On top of that, we’ve seen how social media platforms such as Instagram and Snapchat have shifted the way consumers interact with brands. For example, you no longer have to sit “front row” to experience Swedish fashion brand Acne Studios’ latest collection, you just need to have a smartphone and follow what’s happening via social media. It’s changes like the ones mentioned above that have upended the customer journey and as a result, it can no longer be considered to be a linear funnel designed by brands. Today it looks more like a slinky spiral where customers are accessing information through different platforms and devices. 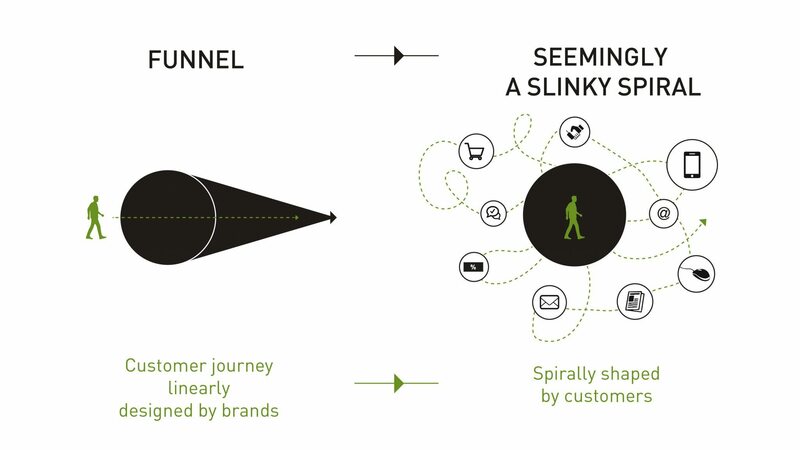 The new customer journey is designed and spirally shaped by customers. Not by brands. What distinguishes Thread from personal shoppers is that they are combining the wisdom of a human and the computing power of an algorithm. The human’s capability to offer his or her sense of style and aesthetic taste combined with the algorithm’s ability to store data about customers’ preferences have enabled them to offer a service which is simple, personalised, and more importantly scalable. Business Insider reported at the beginning of June this year that the platform has over 320,000 male customers in the UK. So how does it work? Users simply create an account and are then given a human stylist who will give the user suggestions via the platform based on preferences such as what style they prefer (weekend, work, dinner or drinks are some of the categories listed on thread.com) and budget (how much they are willing to spend on each garment). The platform will also ask the user about their existing wardrobe to ensure that the new garments seamlessly matches their old favourite pieces of clothing. Thread can with the help of this data provide people with personalised advice and give them the opportunity to buy garments through their growing list of affiliated retailers and brands which according to The Business of Fashion comprise of Sunspel, Folk, Oliver Spencer, Harvey Nichols, Liberty, Urban Outfitters, Jigsaw and Richard James. The clothes you decide to buy will then be sent to you in a Thread-branded box with a physical business card from the personal stylist that has taken care of you. The clothing can, of course, be sent back via mail and you also have the opportunity to arrange a pickup. On a side note, Thread is able to sell the clothes at the original retail price by regularly placing mass orders at discounted rates on behalf of their customers. What’s so fascinating about Thread is the way they are reinventing the whole customer experience of shopping and reaching out to a new group of consumers that are into menswear and want to dress the part, but sometimes do not feel like they have time to browse stores or web shops. Kieran O’Neill and his team have managed to develop a service that truly taps into these new technology-driven consumer behaviours which we initially mentioned in this blog post. Today’s consumers have access to more information than ever before, but the downside is that they feel overwhelmed by all of this content and occasionally confusing marketing messages. Consumers will reward brands that curate content, streamline and simplify the purchase journey – seamlessly. Consumers expect to find information about the product and services they are looking for. There is a growing culture of impatience particularly among young consumers who have gotten used to same-day delivery services and smartphone apps that eliminate the wait for food (Instacart), a cab (Uber) or a table at a restaurant (OpenTable). The demand for transparency has changed the food industry for good and it’s also starting to change the fashion industry. The fashion label Honest By is a great example of a pioneering brand that focuses on transparency and traceability. In fact, they are 100% transparent about how their garments are made and by who. And on their website, you can even find out how much everyone along the supply chain earns. We as humans are more inclined to digest content, advice or suggestions if we perceive it to be relevant. Personalised offers trigger our selective attention and help us engage with the content. Smart companies such as Thread have realised that these factors will be increasingly important in a digital future, and therefore they’ve invested in technologies that will help them remove friction and emphatically design seamless customer journeys that are simple, smooth, transparent and personalised. We believe that all businesses regardless of which industry they belong to should take these key factors into consideration and invest in the know-how and the technology that will help them create seamless experiences and transformations that turn their customers into loyal fans.